“I think we can do five parks in one day. And I can throw in a visit to the Memorial Museum to see “the cannon” in Gonzales. There’s never any hesitation with this group when it comes to combining a great day of state parks and Texas history. Throw in a little BBQ and the fact that we decided March 2nd was the perfect day for this trip and well…that’s heaven on Earth ladies and gentlemen. 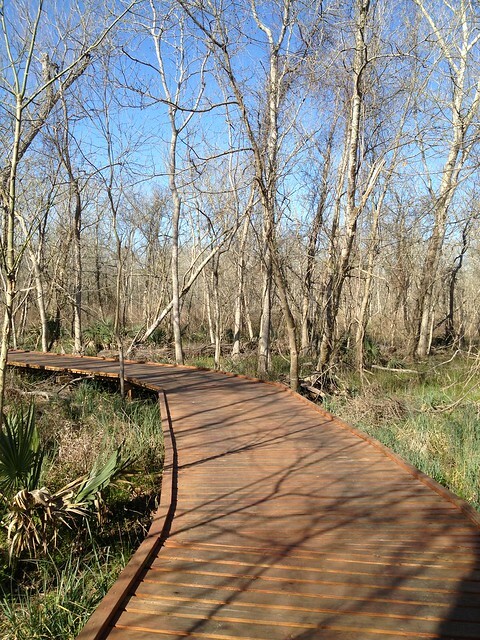 We got to Lockhart State Park right as it opened. This park is relatively small and its primary purpose seems to be to play host to a 9-hole golf course. It is the only golf course operated by the state parks system. There are other golf courses on state park land, but they are operated privately. We were able to cover a few of the trails fairly quickly and actually covered nearly the entire park in 30 minutes because we weren’t playing golf. Although we visited the park on this trip, I won’t mark this park off my list until I return to play the course. On to the next park! Palmetto State Park is right down the road. 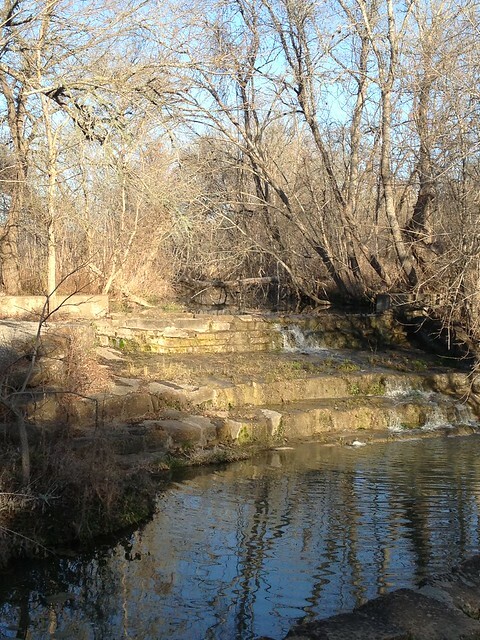 This park turned out to be a somewhat hidden jewel. Combine what used to be swampland with a state experiencing a serious/critical drought and you end up with a beautiful, dark green forest with wonderfully maintained trails. Because the trails are built up to account for rainy seasons (if that every happens again) the trail is in great shape and nearly perfectly maintained. 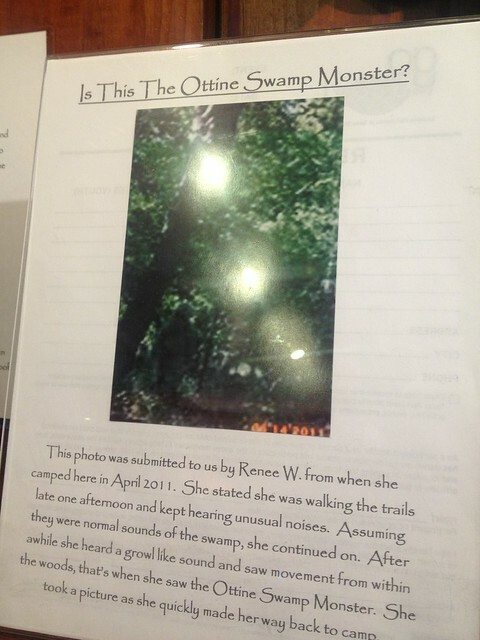 This park has great camping, great hiking, and of course the Ottine Swamp Monster. Apparently, this is the Central Texas version of Bigfoot. I had never heard of it until visiting the park, but one can’t help but notice the “confirmed pictures” of the monster inside the park store. I was drawn to that area for one of my favorite flags (pictured below). I definitely recommend Palmetto State Park for a weekend camping/fishing/RV/hiking/did I mention canoeing?/relaxing destination. Back on the road…we headed to Gonzales. It was a short drive and we made it to the Gonzales Memorial Museum around 11 am. 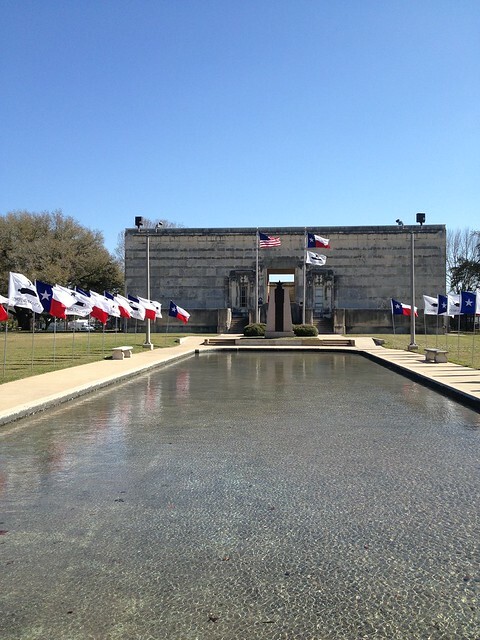 This is the Gonzales Memorial Museum on Texas Independence Day. That’s a little over the top for most, but not for this group. We were a little confused when we walked in. We were the only ones there. I understand that the big visiting season/day is in October/November to commemorate the actual event surrounding the myth/legend/fact? of the cannon of Gonzales so I’ll cut fellow Texans a little slack. Inside the museum is what is allegedly the cannon guarded in Gonzales during the fight for independence from Mexico. 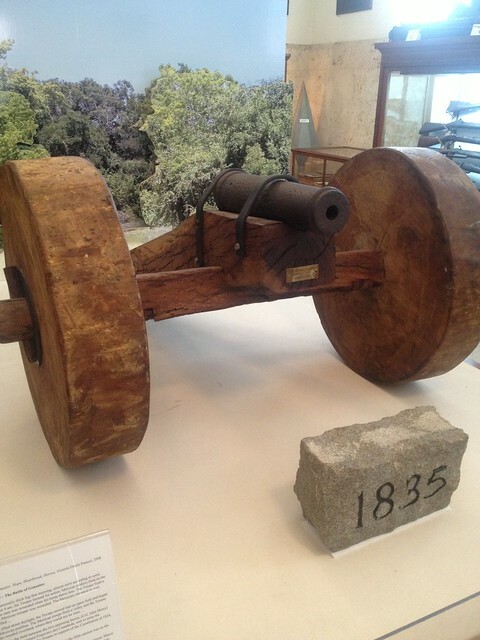 For most Texans, whether or not this is the actual cannon doesn’t matter nearly as much as the ideas behind the story. 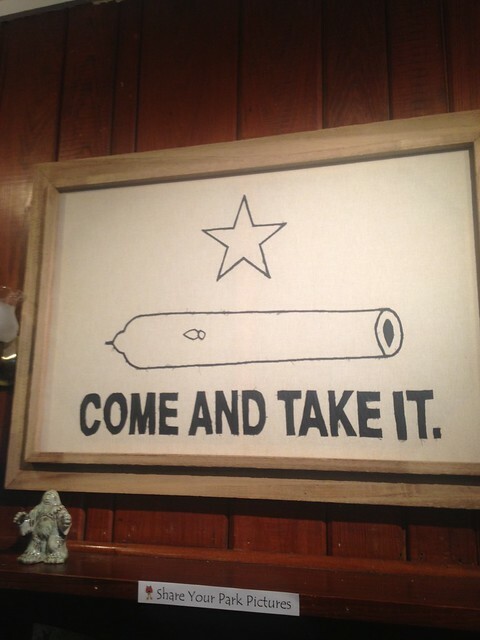 “Don’t mess with Texas” and “Come and Take It” are fundamental to how most of us live our lives. To stand in that room, on Texas Independence Day, with that cannon, and read the stories from that era was a truly memorable trip and should be on every Texan’s bucket list. Time for lunch. We headed to La Grange for some back porch BBQ. No really…Back Porch BBQ in La Grange, TX. This was a surprisingly good BBQ joint and will be a destination on future road trips. We downed a few pounds of brisket, a chicken, and a pound of sausage (b/w 3 people…not too bad, eh?) and then headed, slowly, to the next park. The next stop on our 5-park day trip was Monument Hill and Kreische Brewery. This was going to be another quick trip. You can do the entire (both?) park(s) rather quickly. We spent some time at Monument Hill (more on this in a moment) and then headed down the trail to the old Kreische settlement and brewery ruins. Yes I said ruins. It’s difficult to describe without seeing in person, but the correct word is ruins. Old man Kreische was a stone mason and built the brewery out of heavy stone. All that is left is half of various rooms and several walls along with the foundation. The park ranger does offer a guided tour on request. It’s suggested that you call ahead. This will be a future trip of mine. I’d like to see the inside just for curiosity’s sake. 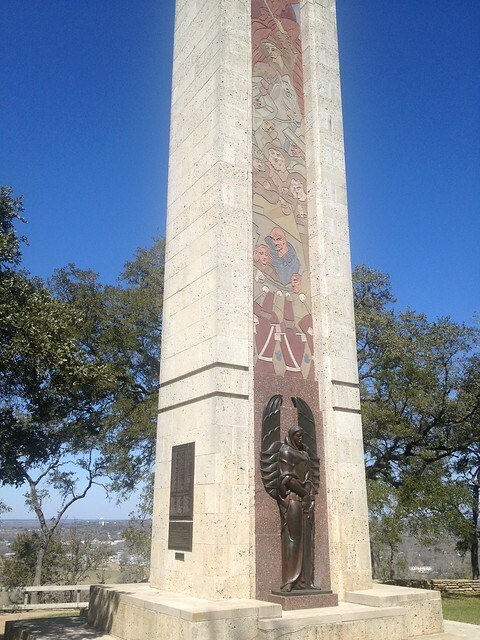 To be at this monument on Texas Independence Day sent chills up my spine and reminded me of how rich of a history our parks have. It was a great way to relax and think after lunch. It didn’t quite prepare us for the next two parks, but it did give us a reason to pause and think about the bigger picture, the bigger story written by the history of our parks. We headed back towards Austin to get to our last two parks before we lost sunlight. It was only about 3:00 PM when we got to Buescher State Park. We stopped and talked to the volunteers at the Park Store and shared our story of our day. Every park store we’ve come across so far has had just amazing staff. They are knowledgeable not only about the park they are stationed at, but most of them know a lot about the parks system overall. Park visitors should make it a point to take some time and visit with your parks staff. You’ll learn a lot, just as much, from that along with the remainder of your visit to the parks. 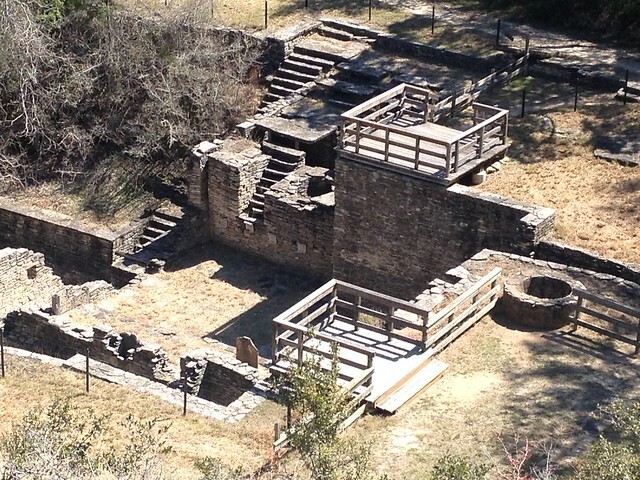 We didn’t stay long at Buescher because we wanted as much time as possible at Bastrop State Park. Buescher is another park that is still on my list to revisit and give another try. Bastrop State Park was our last park of the day. That’s 5 parks, one museum, a bbq joint, and a lot of time in the car. It was all worth it of course. I’m delaying a bit because this last part of this trip drew quite a bit of emotion out of me and writing about it brings it all back again. For anyone who calls the Central Texas area home, the Labor Day Fires of 2011 will never be forgotten. The experience of seeing fires burning on all horizons as you look out from central Austin is an image I will never forget. You look to the west and see fires. You look to the north and see fires. Then you look to the southeast and you see the biggest fire. I remember taking truckloads of supplies down to the Baptist Church in Bastrop and seeing the effect of the fires first hand. 50+ people sleeping on floors in the church. All of them taking care of each other because that’s what you do. Your friends are your family and that’s just how it is. I took time to talk to them and the biggest problem/fear most of them experienced during that time was not knowing. They didn’t know what to expect. they didn’t know if their homes were still standing. They didn’t know if their pets were alive. They didn’t know when it would end. They didn’t know how long it would be before help would be there. 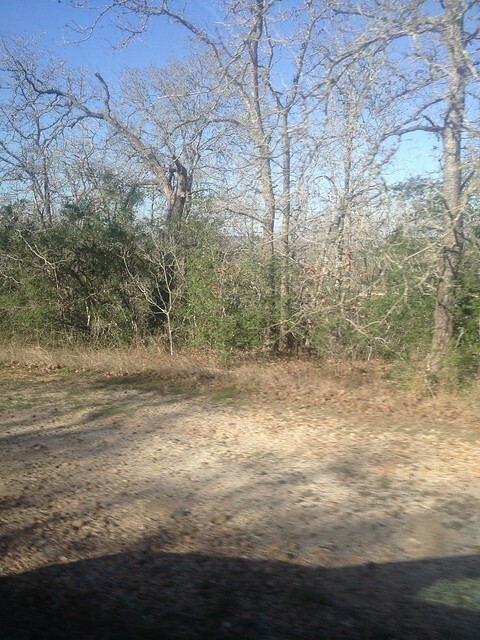 This state of not knowing is sort of what we experienced on our drive in to Bastrop State Park back on March 2nd. It was very different from what the residents faced of course, but it felt intensely personal at the same time. 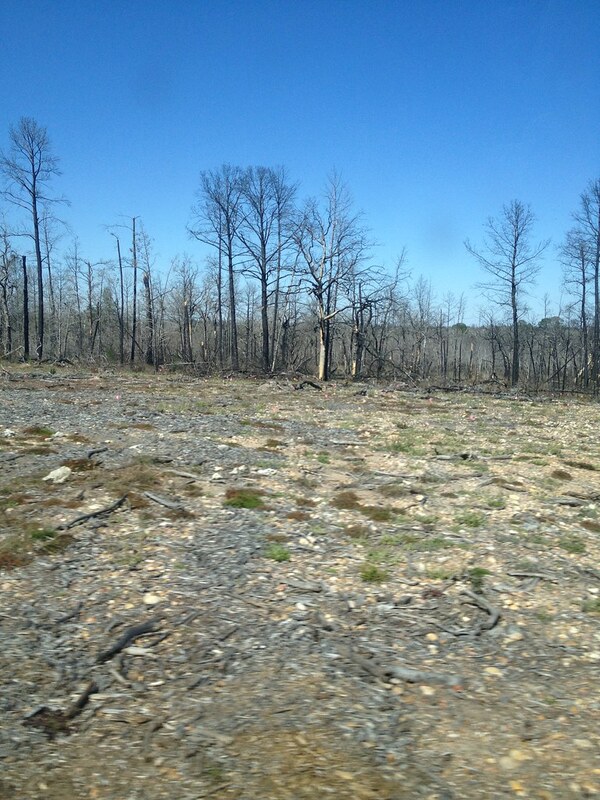 We took the park road from Buescher State Park in to Bastrop State Park so we could take in the full scene of damage, destruction, devastation…no words really. After seeing how beautiful our parks can be and how important they are to our state this was very difficult. The car was silent except for the various gasps and groans as we came around corner after corner and realized we were just seeing a small part of what happened. It took every bit of energy left in me to keep the tears in. You realize how many lives this fire affected and how many generations will be affected going forward and you can’t help but feel a terrible pain deep inside. There are some signs of life, but all of them are new life. Newly planted saplings clinging to life in piles of ash. We needed rain then. We need rain now. Only time will tell. We headed on to the park store. Just as I mentioned earlier your park store staff can be a treasure trove of information. The question I really wanted an answer to was “How long? How long is the expected recovery period?” The answer took my emotions to another level and was quite a shock. look! I see green. It won’t last though. When they bring in equipment to remove trees a lot of the new growth will sustain damage. This is going to be a long recovery process. Let that sink in. 80 years is longer than a lot of us will live. That’s a lot of people who will never experience the park as it once was. We left out of the park store and headed to the trail head. Not really knowing what to expect, but expecting the worst. We started out on an uphill trail into the woods/charred remains. It was about a half-mile in when I asked anyone, already knowing the answer, if they had seen anything green yet. Aside from the rare moss there was nothing. Ash, rocks, and charred remains of once great trees. We continued and paused at a creek that appeared to be a mix of an orange substance and cloudy water. Nothing swimming, not even insects really. We guessed that the orange sludge was fire retardant that was still draining off of the hills and ending up in the creeks. We don’t really know, but it didn’t look natural. We continued on the trail and came across some signs of life as we went deeper in. The signs of life were tokens of false hope really. When we finally saw green it was in what can only be described as a mortuary for the trees. Every tree as far as you could see in any direction was marked for removal. Think about what that means. 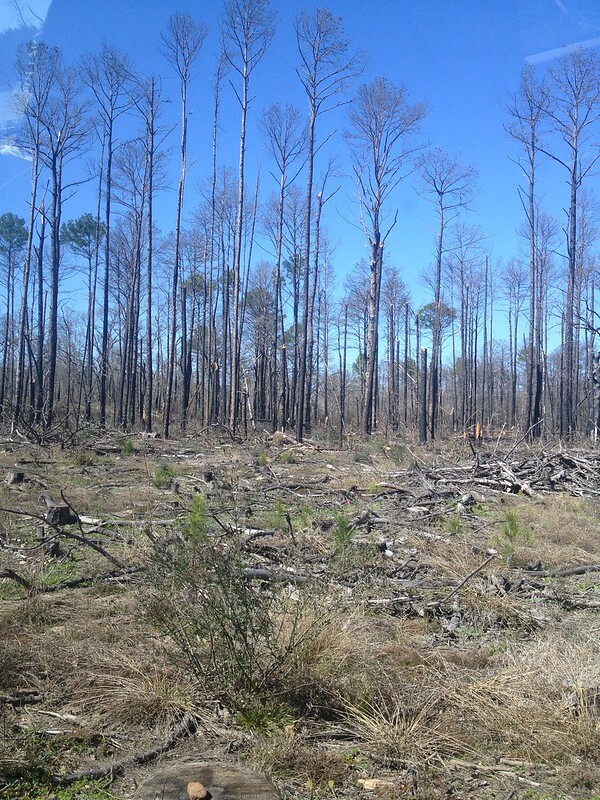 Every tree in every direction for as far as you can see will have to be removed because it is dead.Thousands if not tens of thousands of trees before they can start planting new ones. Add to that the fact that this land is virtually inaccessible to any large equipment and you can imagine how long it will take to clear the land. We finished up our 3 mile hike in mostly silence as we piled back into the car. This was a physically, mentally, and emotionally draining day. If I had to do it over again I wouldn’t change a single thing. From the company, to the food, to the destinations I will never forget this Texas Independence Day.